In 2009, during a particularly turbulent time in my life, a friend of my mum's found herself with a litter of kittens. Her tiny cat had given birth to five balls of fluff, and, in a house with four small children and a boisterous dog, the family couldn't keep them all. They were all adorable, but I could only choose one. Nala, the girl cat who we later discovered was a boy, had the biggest eyes in a tiny face, and clawed his way up my arm during our first meeting. It was love at first sight. A few months later, in late November, Nala came home with us. His personality soon started to shine through; he was naughty, gorgeous, and fussy with cuddles. Even now, he won't tolerate being picked up; he has to approach you, for the privilege of Nala love. But when you get it, it's always super special. Not long after Nala came to live with us, my mum told me that one of his sisters didn't have a home to go to. We went back to the house to find her snuggled up with her mum and the one kitten they were keeping. I picked her up, and she snuggled straight into my arms. She looked up as if to say, "what took you so long? ", and her eyes worked their magic on my mum. She came home with us, and I named her Kiara. Despite being siblings, Nala and Kiara are so different. 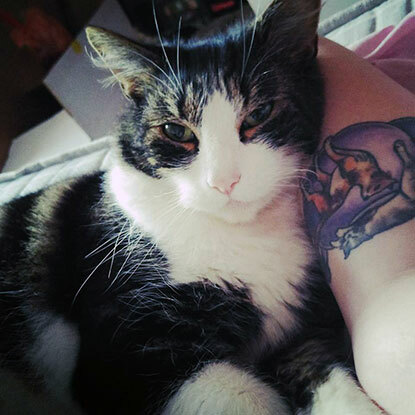 Kiara loves cuddles more than anything else in the world (except maybe Dreamies! ), and, where Nala can be grumpy and lash out at times, she's incredibly tolerant and loving. She follows me around the house, and often spends the entire weekend curled up on my lap. My partner and I have recently moved into our own house, and of course the kitties came with us. The only problem is, Kiara often finds it difficult to choose who to cuddle with! When we still lived separately and my partner would come to visit, Kiara would greet him at the door, and attempt to hide in his bag before he left. Nala has always liked to sleep upstairs with me. Bedtime is the best time for Nala cuddles! He often tries to lead me upstairs for a nap, no matter the time of day, and doesn't quite understand why we have to go to work (although, come to think of it, neither do I!). 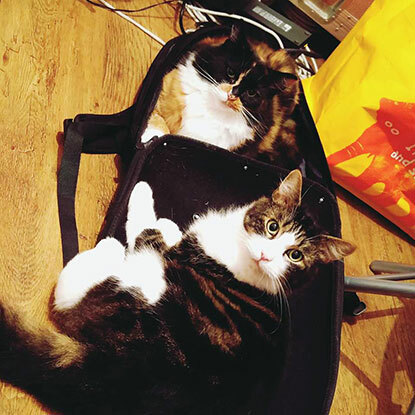 Getting the cats when I did really helped me through a difficult time in my life. I'll never understand the stereotypes about cats – while Nala can be typically standoffish, there's usually a reason for it, and he's also sweet and loving. And Kiara is, without doubt, the most loyal cat I've ever known. They still play like kittens (either with each other or with straws, their toy of choice! ); they have daily cuddles and try to trick us into feeding them more often than they need it! Kiara will take a walk with us, bounding along beside us, never straying too far away, and Nala likes to follow us into the bathroom. Having cats has allowed me to be brought out of myself. They've taught me about caring for others, and brought joy into my life for six years. Above all, they've taught me that love really can be unconditional. I couldn't be more grateful to them. Blue Monday? Colour meow beautiful!